-อยู่ติดริมถนนใหญ่ จอมเทียน สาย 2 มีรถสาธารณะและแท็กซี่ผ่านตลอด 24 ชม. -มีรปภ.และ CCTV ดูแลตลอด 24 ชม. สนใจโปรดติดต่อ. ธนกฤต 080 252 2828. Sell or Rent Atlantis Condo Resort Pattaya Size 36.5 sq.m. 1 bedroom 1 Bathroom , I have many rooms. 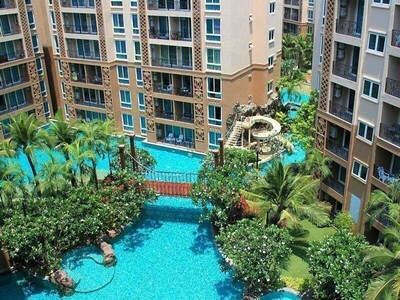 Gardenview,Pool View Nice, Pool acess and every room is Fully Furnished. Ready to move in!!! Atlantis Condo Resort Pattaya will be the first condominium development project in Pattaya to truly deliver resort facilities. Residents will enjoy a themed water park on a large 11 Rai plot of land, which has been designed by one of Thailand s leading landscapers who has created a unique environment for condo owners. Lush exotic tropical gardens surround a swimming pool, that boasts natural waterfalls, sloped beach style edges, and there are wooden footbridges to cross the pool and old style lanterns light up in the evenings to create a charming atmosphere. Children will never be bored as they have their own pool with water playground, water slides and a huge boat. The adults can have fun too in the 5 Jacuzzi, or for the more active residents, the gym is fully equipped with all the latest exercise equipment. The center piece of the resort is an old wooden galleon, with tall masts adorned with rigging and sails, creating the feeling that you are taking part in an adventure movie. In fact it s the club house lounge where you can gather with friends to relax on the sofas to watch TV and enjoy a drink, or watch the fish in the underwater aquarium, or climb up to the deck and lay back on the sun-loungers and get some sun. Relax in the knowledge that you and your property are protected by 24 hours high quality security.